The new Spirit Yachts’ cruising range of sailing yachts offers the same iconic Spirit style but with more volume. 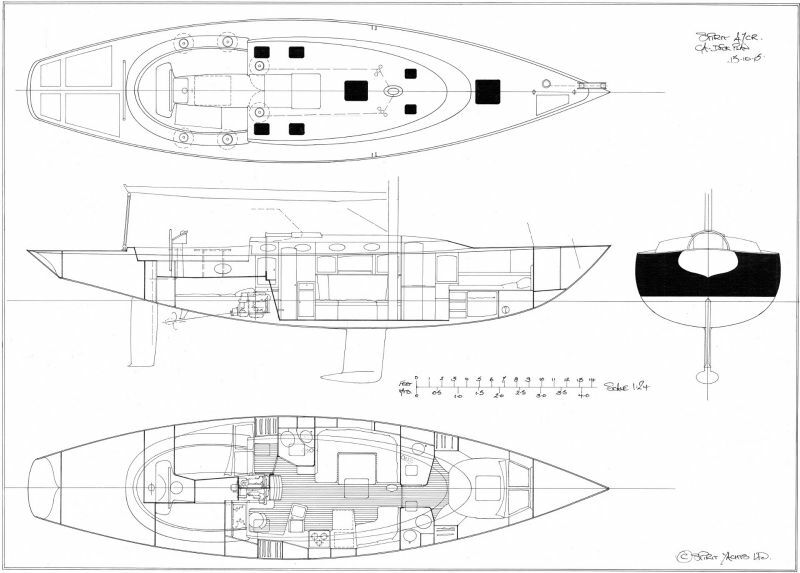 Fresh off the drawing board and new for 2016 is the Spirit Yachts cruising range. Offering the same beautiful lines and classic style as the current Spirit portfolio, the 47CR and 55CR are designed for long distance cruising or for an owner requiring more entertaining and accommodation space down below. The new designs have already proved extremely popular with a 47CR in the first build stages at the Suffolk based Spirit yard. With luxurious air conditioned cabins and entertaining space and the usual modern appendages and technology that accompany all Spirit yachts, the 47CR is ideal for leisure cruising and is certainly not lacking when it comes to performance. An elegant owner’s suite forward includes a king-sized bed with bedside tables, overhead and reading lights with low level mood/night lighting fitted for added ambience. Adjoining en-suite facilities comprise a separate toilet and shower with overhead hatches for natural light and ventilation. Plentiful hanging space alongside multiple cupboards and drawers add to this already spacious cabin. Guests are made to feel more than at home in the comfortable aft double cabin with queen sized bed, handcrafted bedside shelves, plus overhead and reading lights. A full height wardrobe with further hanging space, cupboards and drawers mean guests can really settle in for a relaxing break. The guest cabin is complemented by a separate bathroom with shower, basin and toilet, with overhead skylight for natural light and ventilation. Entertaining is at the heart of the 47CR with a large saloon and a stunning, handcrafted wooden dining table with seating for six guests. To the starboard side, a second sofa offers additional relaxation space. The comfortable saloon provides open plan access to a galley equipped for all levels of entertaining, whether it be a more formal three course dinner for guests or a relaxed meal for two. Galley equipment includes a 100ltr front opening fridge, a three burner gas cooker with grill and oven below, double sink with mixer tap, and tailor-made stowage for cutlery, crockery and utensils. To the starboard side of the companionway is a large, aft facing navigation table with stowage for Almanac, pilot books, charts, instrumentation etc. A porthole in the overhead coachroof provides natural light and ventilation as well as direct communication with the helm position on deck. The chart table may be forward facing with a single navigator’s berth behind as an alternative. 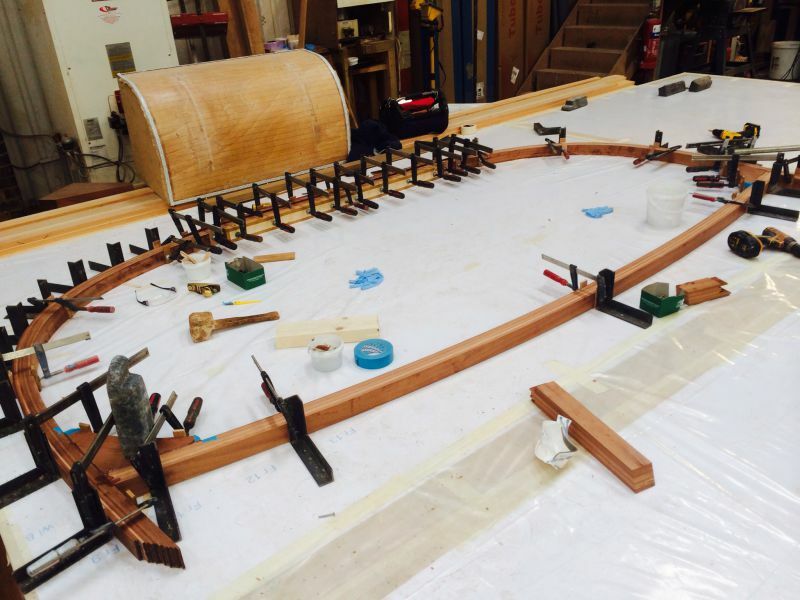 First ring frames for the 47CR being built in the Spirit yard. The eye for detail above deck is as keen as it is below and the aesthetics of 47CR guarantee to turn heads in any harbour. A spacious aft deck provides plenty of room for sun-bathing with a deck shower and stainless steel boarding ladder or optional fold down transom to make a bathing platform. The latest in sailing technology means the Spirit 47CR is built for speed as well as comfort. As with all Spirit yachts, she comes complete with carbon fibre mast and boom with nitronic rod rigging. Handling is smooth with a 42” mahogany and stainless steel wheel fitted with steering brake and a single lever throttle and gear change lever situated near the helm position. Helm instruments are fitted to the client’s requirements. Anchoring is facilitated by a Lewmar vertical windlass complete with remote deployment and stowage from the helm and foredeck. In addition to storage lockers in the cockpit, a large lazarette offers additional stowage and simple access to a stowed dinghy and all cruising equipment. If the Spirit 47CR doesn’t suit your needs, then perhaps the 55CR with additional guest cabin, larger owner’s suite and increased entertaining space is what you are looking for; find out more details here.